Crytek believes free-to-play is the future, at least until aliens invade. Crytek isn't an especially big fan of used games, but what can it do? Well, starting with Warface, it can give away its games for free. As it turns out, Crytek isn't too thrilled with the current sales practices of most F2P games, and aims to throw its hat in the ring with some AAA titles that will go easy on the bank - both its own and the hypothetical player's. While the company's two big-budget sequels Crysis 3 and Homefront 2 will come in $60 packages as planned, they will herald the end of a pay-to-play era for the German developer. "As we were developing console games we knew very clearly that the future is online and free-to-play," says Cevat Yerli, Crytek's CEO. "Right now we are in the transitional phase of our company, transitioning from packaged goods games into an entirely free-to-play experience." 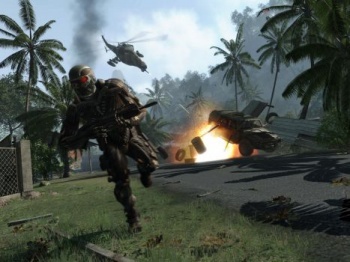 Aside from Warface, Crytek has not announced any free-to-play titles, but it plans to spend a respectable $10-30 million developing each title. Yerli suggests that current F2P practices are "literally milking the customers to death," but has yet to detail how his company plans to tackle F2P payments differently. Leaving aside the gruesome image of death by literal milking (how would that even work for male customers? ), Crytek's decision is a fairly weighty one. While it's not one of the foremost heavy hitters of the AAA world, it's released a number of profitable, high-profile titles, and has decided that it could make more money without charging an admission fee. If this strategy works for Crytek, which AAA developer will be the next to travel the wild and untamed F2P road?